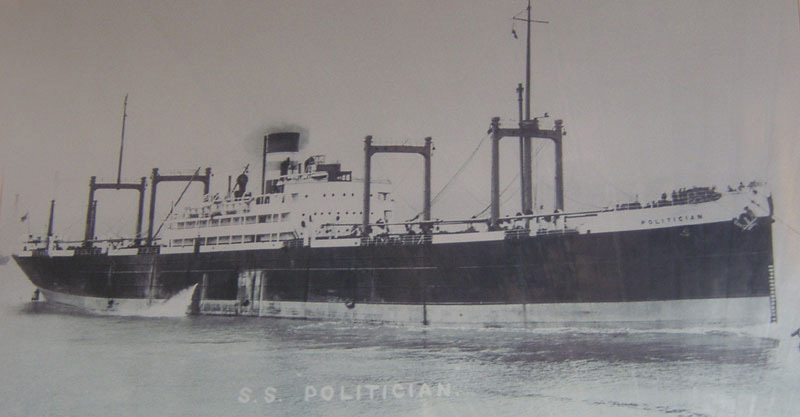 One of the most well known events in the recent history of the Western Isles was the wreck of the SS Politician on the 5th February 1941 and the story was used by Compton Mackenzie for his book Whisky Galore, and later for the Ealing Studio comedy by the same name. Relics and images can be seen at the Am Politician pub and restaurant on Eriskay. On the morning of 5th February a young man was combing a beach in South Uist when he saw the ship in trouble and beginning to list. 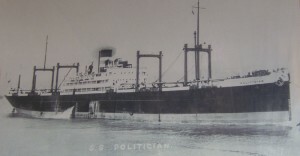 After a valiant struggle by the Captain, Beaconsfield Worthington, to keep his ship on course, the SS Politician eventually ran aground in the storm onto sandbanks off the Isle of Eriskay where she began to flood. Unfortunately as the ship had veered off course an incorrect location was given to the lifeboat crew on Barra. Local islanders were roused and they set forth in a sailing boat to offer assistance to the crew. The lifeboat finally reached the ship and all the crew were rescued. When the locals learned from the crew exactly what the ship was carrying, a series of illegal salvage operations took place at night, before the customs and excise officials arrived. 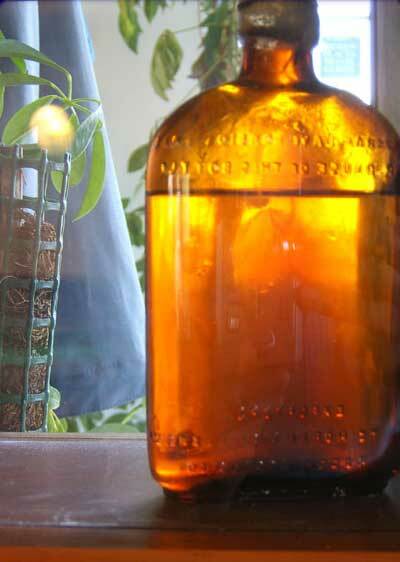 The islands supplies of whisky had dried up due to war-time rationing, so the islanders periodically helped themselves to some of the 260,000 bottles of whisky before winter weather broke up the ship. Boats came from as far away as Lewis as news of the whisky travelled across the Outer Hebrides. No islander regarded it as stealing, as for them the rules of salvage meant that once the bounty was in the sea, it was theirs to rescue. On 26 April at Lochmaddy Sheriff Court a group of men from Barra pleaded guilty to theft and were charged between three and five pounds. Mr McColl was furious at the leniency of the men’s sentences, but the police, being mainly locals themselves, were tired of the bothering the locals who had not, in their minds, done such a bad thing. However, Mr McColl continued his crusade against these illegal salvagers and some of the men were sentenced to up to six weeks in prison in Inverness and Peterhead. In 1987 Donald MacPhee, a local South Uist man, found eight bottles of whisky in the wreck. He sold them at auction for £4,000. The wreck of the SS Politician still lies off the coast of Eriskay, although it is below the water line as winter gales have destroyed the deck and cabins. In 1988 the island got its own ‘legitimate’ pub, named ‘Am Politician’.